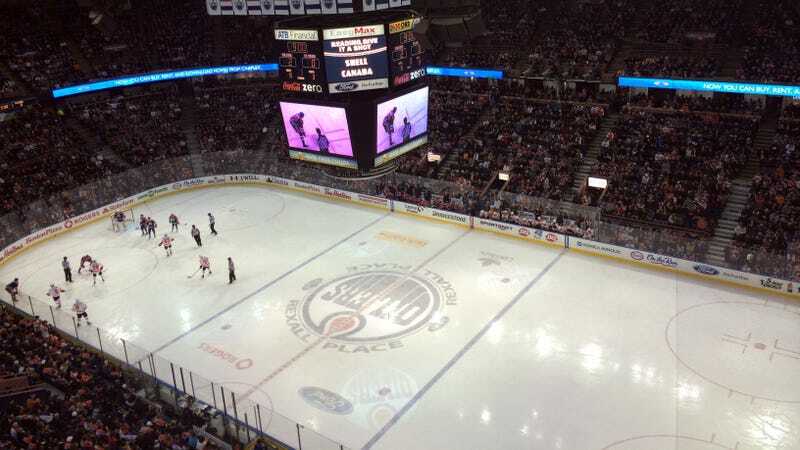 It is entirely possible that there are simply not enough toilets at the Edmonton Oilers’ arena to accommodate playoff-sized crowds. Bathroom lines are an unfortunate, although not outrageous, side effect of popular sporting events, or really any large gathering of people downing beers. But the Oilers managed to go beyond simply inconveniencing their fans when they decided to convert two women’s restrooms into men’s restrooms for Game 3 of their Western Conference semifinal Sunday night. The Oilers claimed that a survey of season ticket holders showed that attendance of playoff games skewed male, which led to a lot of male fans complaining about long bathroom lines, an issue the Oilers initially tried to solve by adjusting the queue formation. The team didn’t provide any hard data to back the claim of an unequal gender split, and when they tried changing the bathrooms to better accommodate the men, women were left complaining about long lines. The Oilers, however, have decided that this specific fan experience is something they can live with. Global News spoke to the (female) general manager of Rogers Place, Susan Darrington, who defended the team’s decision. For playoffs, what we’re seeing is we’re getting predominantly men in here – the more exciting the hockey gets, I think the less guys are willing to give up their tickets. So we’ve adjusted our plans and we flipped a restroom on our main and on our upper concourse to be more available for men. You’ll never make everyone happy. I think we actually feel good about what we’ve done. The men are getting through faster, the women are seeing a little more of a delay. Maybe there are more men than women at the game, and maybe the Oilers have the data to prove it. If that’s the case, it would make a certain amount of sense to skew the bathrooms proportionally. But it’s hard to take Darrington seriously when her explanation comes with the implication that there are fewer women at the game because the menfolk, who surely purchase every single ticket, are no longer doling them out to uninterested ladies once the games get important. Aside from that, it’s bad business to publicly state that you “feel good” about actively alienating 50 percent of the population (a nice, untapped market, too, by the sounds of it!). I don’t know why they couldn’t make it just one unisex bathroom. You could have a choice. If you don’t want unisex, you go to the guys’ or you go to the girls’ washroom. Our desire to empty our bladders in a timely manner should unite us, not divide us.